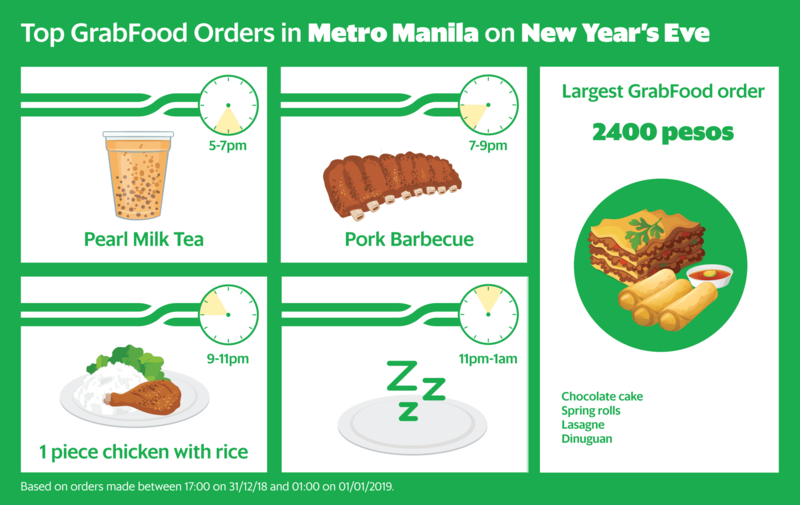 Popular New Year’s Eve celebration spots in Metro Manila included Okada Manila and SM Mall of Asia, which were the top drop-off and pick-up points of the night as revellers flocked there for live music and fireworks. Okada Manila drew the crowds with shows and an exclusive concert, while SM Mall of Asia hosted the musical-variety themed GMA 7 New Year Countdown special with Kapuso stars. In the Philippines, the most popular food items ordered included donuts, barbecued pork and pearl milk tea. We also know that someone had a large party because they ordered 2,400 pesos worth of food!